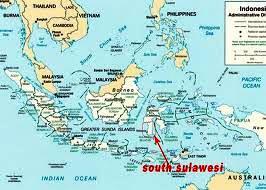 Barbara and I were fortunate enough to visit this exotic part of Indonesia (a country not short on exotic places) in 1984. Our timing was excellent as it had yet to be discovered by tourists. We departed from Ujung Pandang, a port city rife with Bugis pirates, in a beat up World War II Jeep heading north to Rantepao, the Toraja capitol. We arrived after a bone jarring, teeth clashing 12-hour ride. Our conclusion was that it was not a road but rather a suggestion of direction through swamps, jungle and winding mountain paths. Today you are delivered in a comfortable seat in a Boeing 787 (Barbara’s comment: Boring!!). 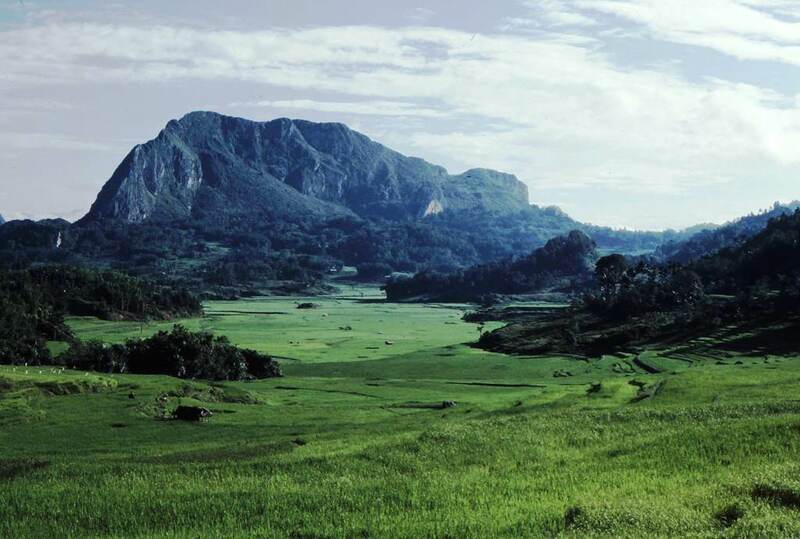 For hundreds of years the Toraja have lived in remote hill top villages of five to fifty picturesque houses known as tongkonan. These traditional ancestral structures stand high on wooden pilings, covered in a layered split-bamboo roof that curves up in a sharp arc resembling water buffalo horns and incised walls with intricate black, red and yellow carvings. Their mythology says the first tongkonan was built in heaven and symbolically links the ancestors to the living and those to come in the future. 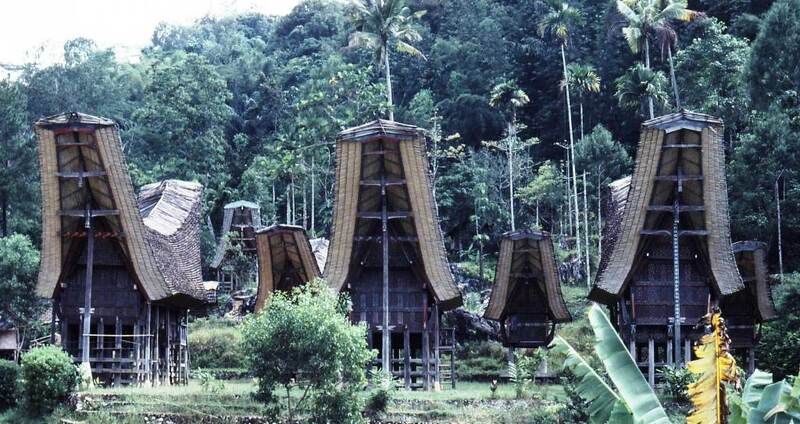 Tana Toraja is known for elaborate funeral rites. They rank among the most spectacular celebrations of death in the world. As the importance and wealth of the deceased increases, the more over-the-top the ceremony becomes. But first money, lots of money, must be accumulated to produce the funeral . Torajans do not see death as an abrupt event but rather a long journey for the dearly departed on their way to Puya, Land of the Souls. 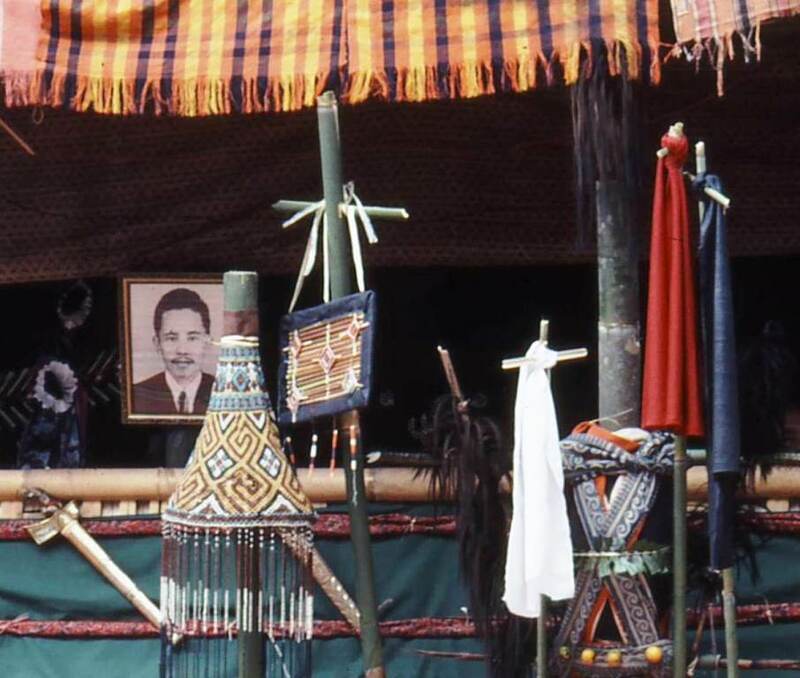 Thus the ceremony can be delayed weeks, months or even years after what we would consider “time of death.” During this period the body is bathed, a bamboo tube inserted so bodily fluids drain from the corpse to beneath the tongkonan, the ancestor is dressed and placed on a chair in a corner of the house. While there, the departed is considered very sick but not deceased. They are offered food, fruit, whiskey, cigarettes and other items that the living use or need. When the funds are sufficient, the ceremony may commence. In ancient times the Torajans believed certain special people were able to make the deceased walk back to his village of birth. This was necessary so that his relatives could guide him on his journey to Puya. Today with an improved transportation system they rely on more modern means for the journey. The next step consists of two important ceremonies. On the first day is the Mapasanglo where the body is carried around the home by relatives for one last time. The next day, Rutaun Kuma, preparations begin for the arrival of the mourners. 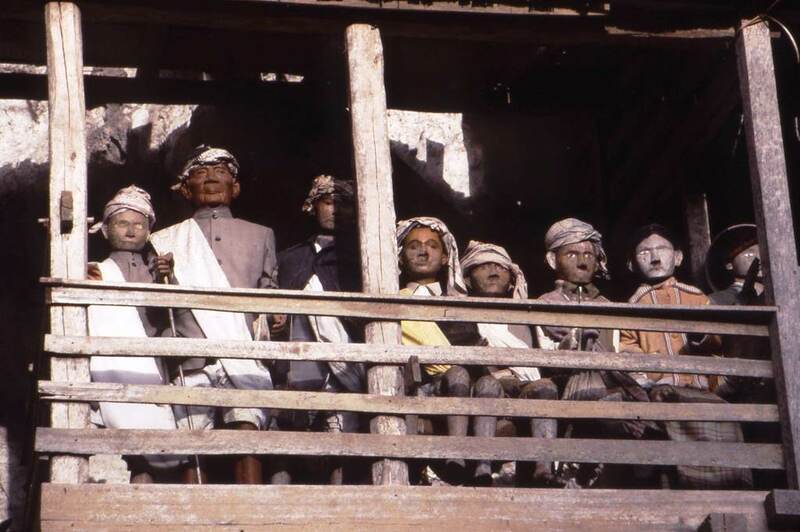 Depending upon the importance of the deceased and the number of the persons expected to attend the ceremony, temporary tongkonans known as tampang must be erected to house the guests. The number of structures may range from 10-15 up to 100 or more. When this project is completed people begin to arrive. For Torajans, a funeral is not a sad occurrence but rather a celebration of the life of the person. 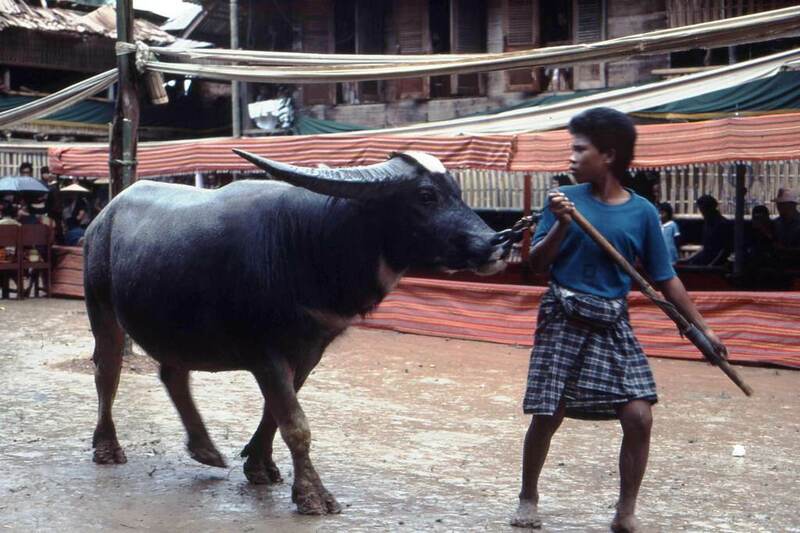 The family, as well as guests, provides water buffalos and pigs for sacrifice and to feed the masses. This buffalos are lead into a temporary arena where a family member, with a very sharp sword, beheads the animal with one swift blow. Again this rite may last for hours depending on the importance of the deceased and the quantity of sacrifices made. Numbers of buffalo can top 100 beasts. The reason for this action is Torajans believe the more animals killed, the faster the departed will reach Puya. 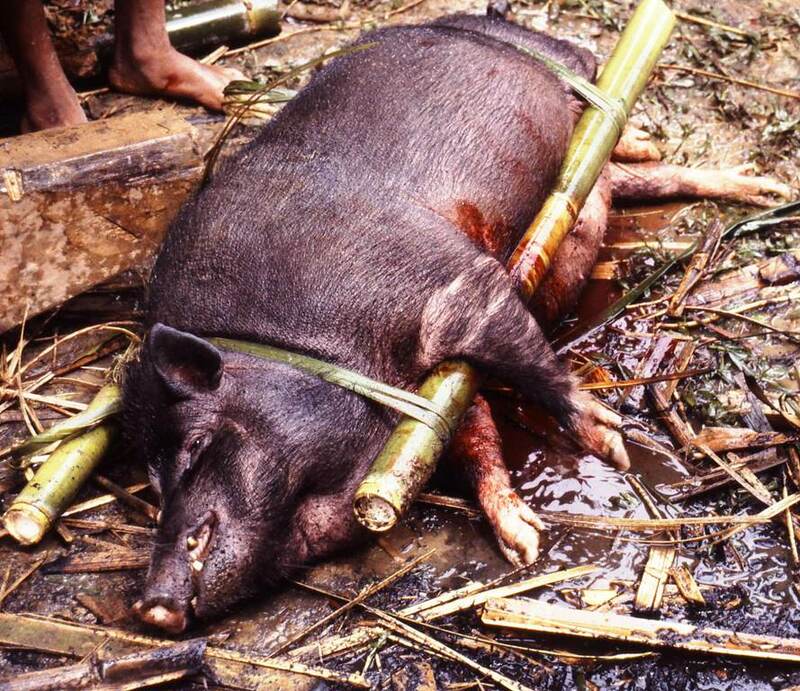 Pigs are also sacrificed but outside the arena. Their number can range up to 1,000. The ceremony can go on for several days to more than a week. 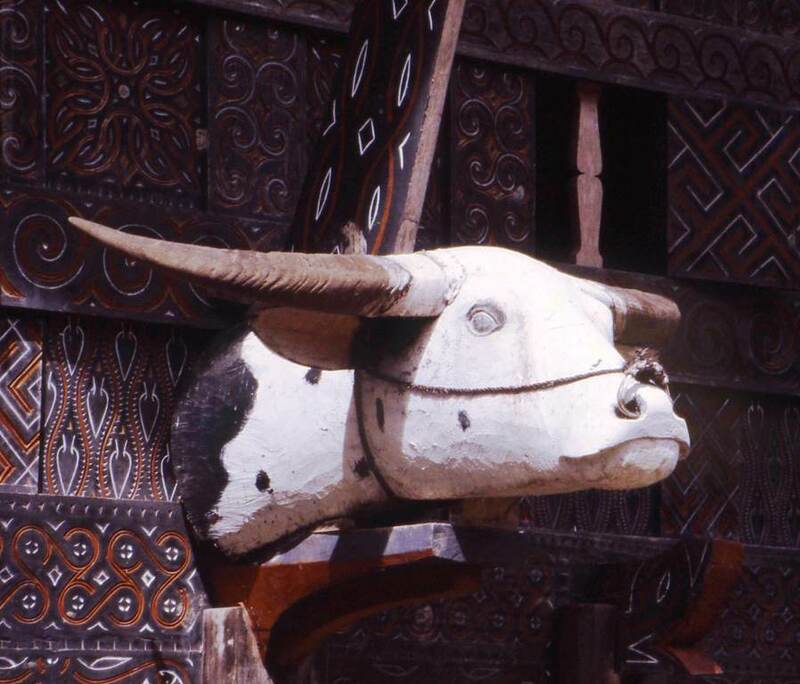 Following the funeral the horns of the buffalo are mounted on the family’s tongkonan. The more horns, the more important and wealthy is the family. Burial of the deceased occurs 11 days after the end of the ceremony. The graveyards of the villages of Lemo and Londa are the most interesting and unusual. 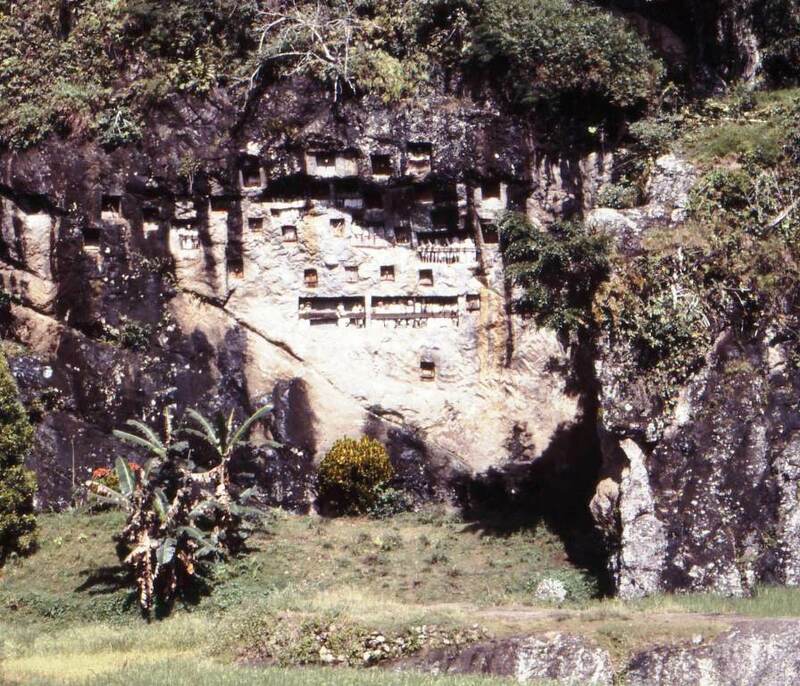 In both places the graves are carved into sheer, vertical rock face just outside of the village. The family hires a to pande batu, a very skilled and courageous rock carver, to climb the cliff and chisel the grave. It is most often about three yards deep into the cliff and about one yard square on the edges. The corpse is wrapped in a traditional sarong, a colorful length of batik fabric and placed inside a wooden coffin. The to pande batu must then scale the cliff and insert it into the rock face. Needless to say this is a very difficult and dangerous maneuver. 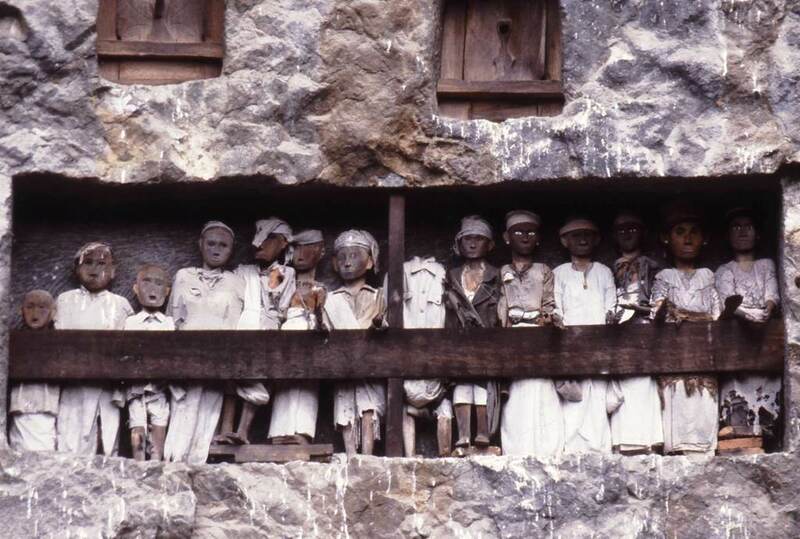 In Londa, bodies are also interred in wooden coffins in a stalactite filled limestone cavern in the side of a rock cliff. Over the years most of the coffins deteriorate and fall apart leaving the bones to fall on the cave floor. Why some of the deceased are not placed in a new coffin is unknown. 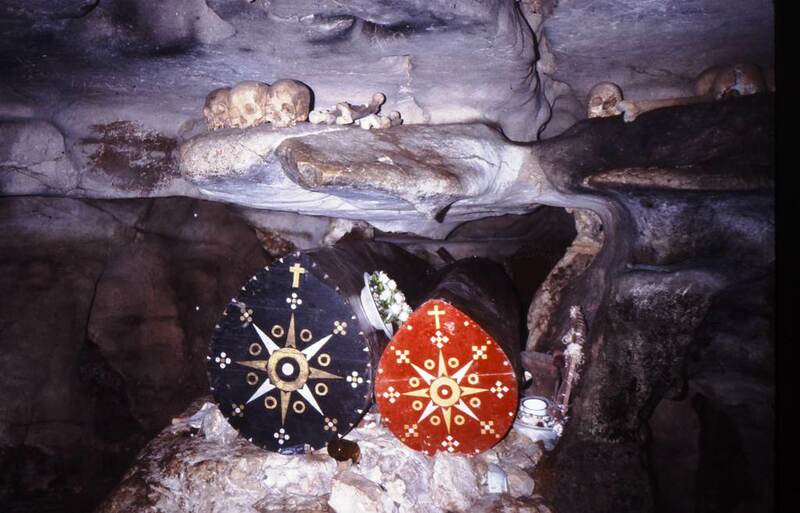 Visitors to the cave must walk with care not to step on the scattered remains. 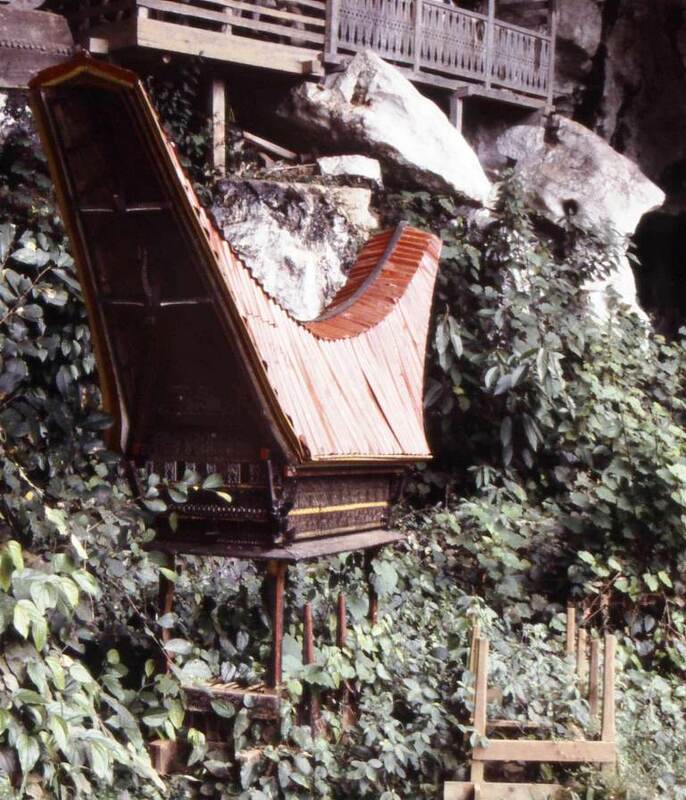 The most unusual and interesting Toraja funeral practice is the carving and placing of a tau tau, a wooden or bamboo statue created to look like the deceased, up on the cliffs on porches in front of the graves. Tau tau means men or statue. They represent the deceased and are ever-guarding the graves and those living in the nearby village. Tau tau probably originated in the 17th century. 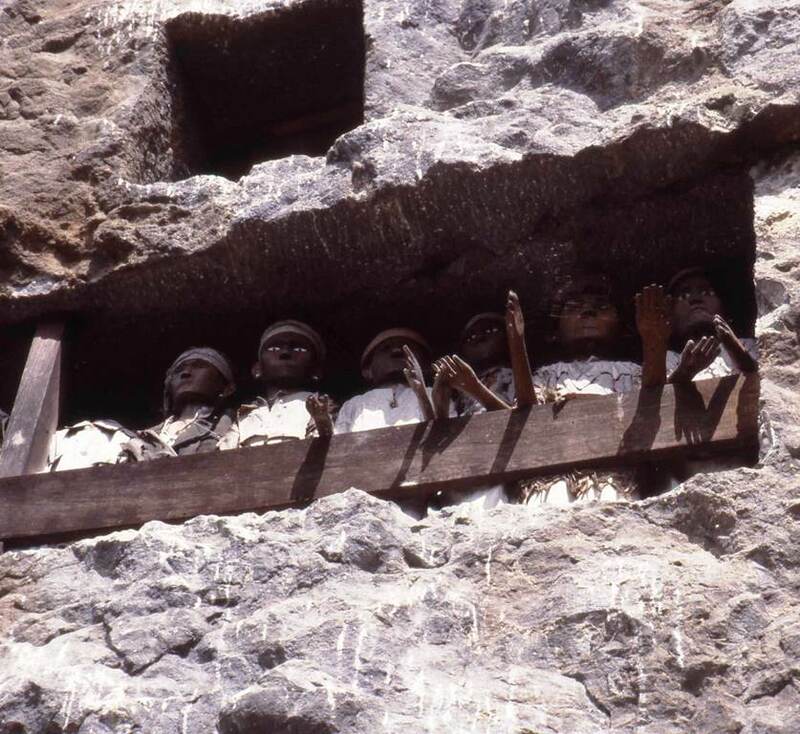 They are life-sized effigies who stand in a line on balconies high on the cliff face. Colorfully dressed, men in pants, women in skirts, their eerie eyes shimmer and shine looking out over the valley. In many cases they have one hand extended in what appears as a gesture of welcome. In the early 1900s, Dutch missionaries tried to discourage creation of the statues but the effort failed. However, the arrival of the 1980s came with a more dangerous fate for the tau tau. Two village boys stole several statues and sold them in Jakarta. Upon returning to the village, they died under mysterious circumstances. Villagers say they were killed by the spirts of the tau tau. That did not stop grave robbers who targeted them, selling many to museums around the world. As a result the villagers removed the tau tau to hiding places and fencing was installed on the cliffs for additional protection of the graves from ghouls. It is taboo to touch the tau tau except in two circumstances. First villagers may come to put offerings in their extended hand asking for permission to communicate with an ancestor. The other is every 5 or 10 years the heirs hold a taanee, a special ceremony under the direction of an elder keeper when the descendants clean the statue, change the clothes, repair damaged coffins and collect any scattered bones.